And it's pretty much as outlined in those conversations: session strength beers to be sold in 12-packs (of old school stubbies) at little more than $30 a pop. 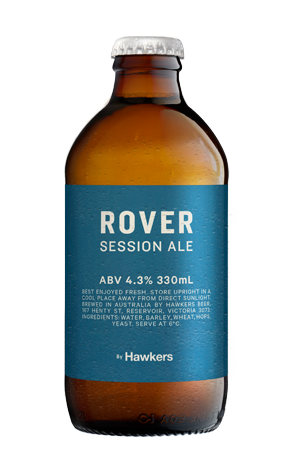 The first two Rover beers are this Session Ale and a Session IPA – which is listed here. The Ale is the slightly boozier of the two yet looks and feels lighter; a hefty proportion of wheat gives this uber-pale beer both its witbier like haze and contributes, alongside lively carbonation, to its lightness on the palate. Hop character is of the limey, tropical bent, with the Aussie varieties also lending a touch of resin to the bitterness. It's a beer that sits character wise in summer ale territory and finishes in a manner that can best be described as "beery", presumably as its got its sights set on beer drinkers more than craft beer drinkers.